Let’s all laugh at the shape of cucumbers together. When you toss this salad, the lime and oil mixture, the avocado and the feta all kind of combine into a nice rich dressing-like coating that is very satiating for a salad made up mostly of a watery vegetable. Unfortunately this isn’t exactly a make-ahead, even if you leave the avocado until the last minute because the cucumber slices do get a little bit soggy. The best part, though, is it uses a ton of cucumber (2 whole ones! ), which is nice if you have a whole garden full of them and your neighbors have started saying “Ohhh, thanks but no thanks…” As they subtly cover up the ones they’ve already thrown in the garbage. One last note. Some people complain that cucumbers have an ill effect. I’m talking about flatulence. This is caused by the seeds, so unless you have a thing against cheese, this salad shouldn’t bother you. I like to use a grapefruit spoon to remove the seeds. The little razor edge is good for scraping. First, put your cucumber slices in a sieve, sprinkle with salt, and let drain while you prep everything else. Chop the avocado into chunks and sprinkle with juice of 1/2 lime. Chop the mint and add to the avocado. Whisk together the olive oil, sugar, lime zest, lime juice, and salt and pepper to taste into a dressing. Chop the mint and add to the avocado. When the cucumbers are done draining, give them a quick rinse and pat dry with a paper towel. 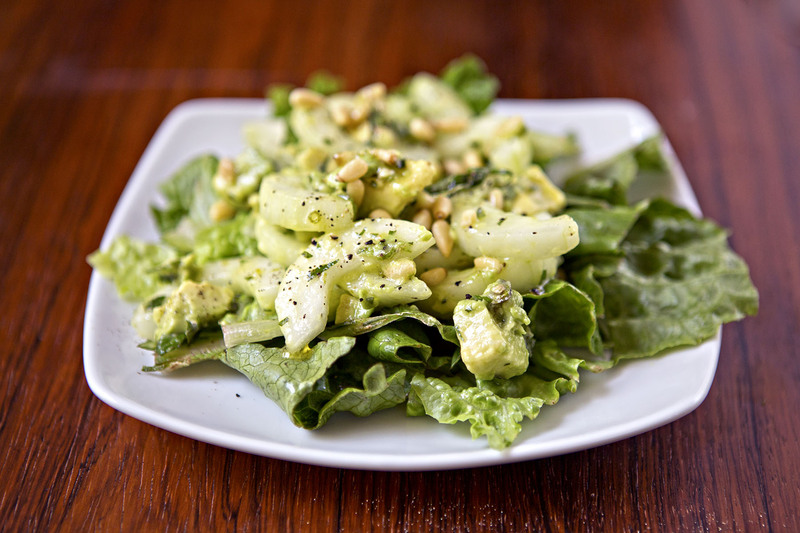 Add to the avocado mint mixture, pour the dressing over and add the pine nuts and feta (if using). Toss well. You can let the whole salad sit in the fridge for up to about half a day. Garnish with more pine nuts. Serve plain or over a bed of fresh lettuce.